On the bus, at the hotel, by the seaside, under the weather...wherever you are, you'll need the right words to express yourself. No worries! 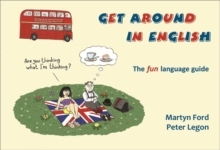 With Get Around in English you'll know what to say to anyone, anywhere, at any time (well, more or less). The book is packed with modelconversations, cultural clues, vital vocabulary, and comic illustrations in every unit to help you brush up your language and laugh along the way.